This unforgettable story a group of working class boys from the wrong side of the tracks who became one of the biggest pop music phenomenons’s, Jersey Boys, the smash hit Broadway musical sensation, opened in the West End in February 2008 and has transferred to the Piccadilly Theatre. Discover how the Jersey Boys from the wrong side of the tracks invented their own unique sound, sold 100 million records worldwide and were inducted into the Rock & Roll Hall of Fame. 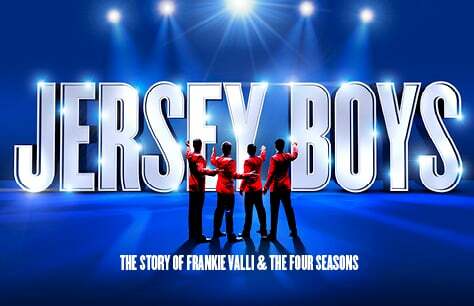 With spectacular performances of all their hits, Jersey Boys is the electrifying true life story of Frankie Valli and the Four Seasons; the mob, the heartaches, the triumphs and the music! Winner of 54 major awards worldwide, Jersey Boys in London won both the Whatsonstage.com and Olivier Awards for Best New Musical in 2009. Featuring all the classic hits, the Jersey Boys songs include Beggin, Can’t Take My Eyes off You, Oh What a Night, Walk like a Man, Bye Bye Baby, Sherry and Big Girls Don’t Cry.